The DA holds its own archive of historical material, mostly composed of group photographs at Annual Meetings and past Presidents, together with some other less formal images, dating from 1893 to 1982 with lots of gaps. In order to make these images accessible and usable, a catalogue is in the process of being produced. Included in this catalogue are photographs from other sources, notably the Dartmoor Archive. So far, over 150 photographs from all sources have been catalogued with as much information as possible. 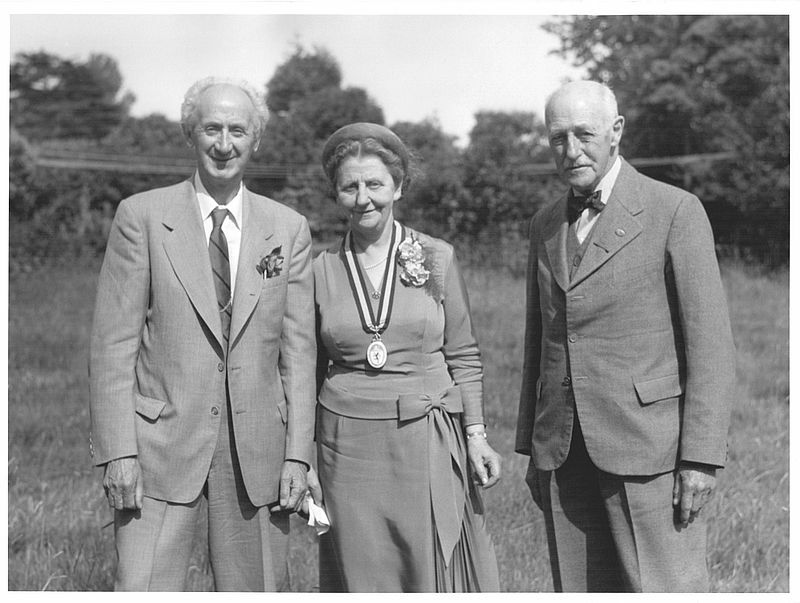 Miss Ursula Radford FSA, President of the DA 1955, flanked by two DA Officers as yet unidentified. Eventually, all images held by the DA will be available for publicity purposes and the best displayed on our website. There is much work still to be done in searching out other photographs of DA activities in newspapers and other repositories. The availability of these will vary according to the repository but knowing what and where they are is important if they are ever to be useful. We would very much like to hear from anyone who has any pre-digital images of DA activities (the older, the better). Please let me know and we can arrange for them to be scanned and placed on the database. Email: dabschair@devonassoc.org.uk. May 2018: we currently have a mystery group photograph that we’re asking for help in identifying. See it here.